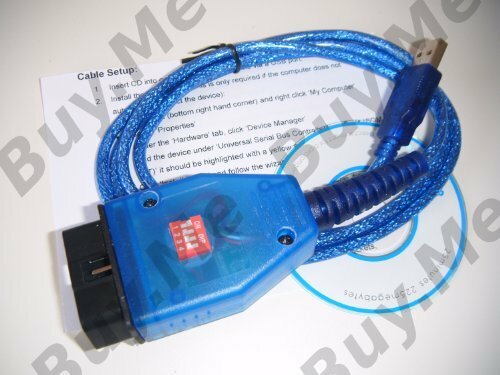 Connect this cable from your PC / laptop to your Fiat or Alfa's ECU Computer. This will diagnose and clear faults relating to the cars engine, airbags, breaks and manual transmission (selespeed). The cable has been altered to communicate with the ECU's found on Italian cars. It connects a switch (4 way dil) between pins 1,3,7 and 9 to the KLine so that the cars computers can communicate with supported software, (such as FiatEcuScan and AlfaDiag). Using a switch is the advised method found on the FiatEcuScan website. Please see the relevant softwares website for a list of supported ECU's. The cable does not support CAN. Some models may require the full versions of these software products to communicate with some ECUs. Please see the full list of supported models and ECUs on the specific software providers website.